From the Baldwin County Courthouse, go east on Hancock St. and follow Highway 24 southeast for 13.9 miles. Locked metal gates on the right side of the highway mark the entrance. 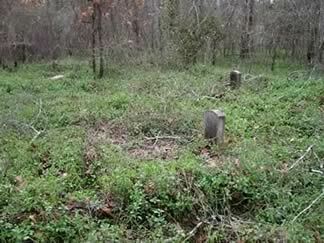 The cemetery is 1.3 miles from Hwy 24 - not visible from the gates and not accessible to the public. 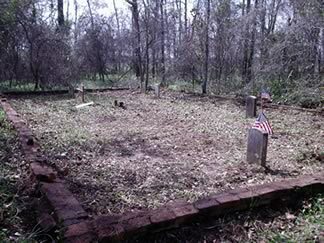 The pictures are similar views of the cemetery before and after being cleaned up on Feb 26, 2005 by the Friends of Baldwin County Cemeteries and the History Club of Georgia College & State University. South Carolina Captain, State Mil. Georgia, Ensign Dawson's Co, 7 NC Regt. consort of William Whitaker. Blessed are the dead which die in the Lord. Rev XIV 13.